The American Red Cross has updated its tornado safety guidelines, modifying longstanding recommendations putting them in conflict with those provided by NOAA and the National Weather Service. The new guidelines no longer recommend evacuating a car if a tornado is about to strike and finding a low-lying ditch to hide in. Instead, the Red Cross is now recommending remaining in the vehicle. Until now, all tornado safety guidelines were consistent in saying that remaining in a car during a tornado, just like a mobile home, is one of the worst possible places to be. 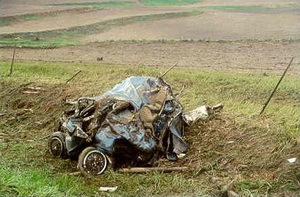 The vehicle stands a great chance of being picked up and thrown and destroyed with its occupants trapped inside. The National Weather Service, and the Red Cross until now, believes that lying flat in a ditch provides a greater chance of survival. Your body provides a smaller target for winds and by being in a ditch, debris and winds have a better chance of passing over you. Get into a vehicle, buckle your seat belt, and try to drive at right angles to the storm movement and out of the path. If strong winds and flying debris occur while you are driving, pull over and park, keeping seat belts on and the engine running. Put your head down below the windows, covering with your hands and a blanket if possible. Vehicles are extremely dangerous in a tornado. If the tornado is visible, far away, and the traffic is light, you may be able to drive out of its path by moving at right angles to the tornado. Otherwise, park the car as quickly and safely as possible — out of the traffic lanes. [It is safer to get the car out of mud later if necessary than to cause a crash.] Get out and seek shelter in a sturdy building. If in the open country, run to low ground away from any cars (which may roll over on you). Lie flat and face-down, protecting the back of your head with your arms. It should be noted that the “recent study” the commendations cite is actually an older one from 2002. Further, Mr. Bissell’s blog comments have since been removed from the website. Now Americans are faced with two competing recommendations which could make the difference between life or death. Many believe the Red Cross’ issuing of these new recommendations without collaboration with the weather experts at the National Weather Service is irresponsible. However, there are no hard rules when dealing with Mother Nature and what works in one situation, may not work in a comparable one at a different time. 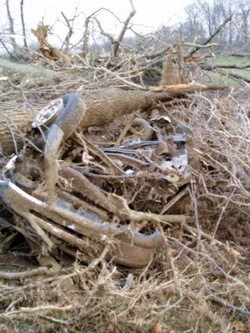 This vehicle was destroyed by a tornado - if you were in it, would you have survived? When driving in open country and you see a tornado, simply drive away from the path of the tornado – usually at a 90 degree angle to the path is best. While we all have seen video of people doing it, do not seek shelter beneath a highway underpass as these act like wind tunnels and actually serve to increase the wind speed and collect flying debris. In the extreme situation that you simply cannot get away from a tornado, abandon your vehicle immediately. Lie down in a ditch or culvert and cover your head. This isn’t a particularly good option, but it is safer than remaining in a vehicle. If you are caught outside with no place to seek shelter, crawl into a ditch or culvert and cover your head. Getting as low as possible will decrease the odds of you being struck by flying debris. This is not ideal, but it is your best course of action. Ideally you would of course escape the tornado by outrunning it as outlined above or seek shelter in a sturdy building – knock on doors if you have to. If you are that close to a tornado, pray! If the option to drive the other way is not available… it is luck of the draw. I used to tell my students to get out and curl down in a low ditch by the road with their heads covered – to protect from flying debris. Honestly, who is going to think of getting outside when it gets worse? The car may provide some protection from flying debris. Which in a tornado, could be another car. I can see the fault in getting out of your car, only to get hit by another. The myth of hiding under a highway overpass has been proven wrong. So, drive away or pray! This entry was posted on Thursday, May 7th, 2009 at 7:40am MDT and is filed under Severe Weather, Weather Education. You can follow any responses to this entry through the RSS 2.0 feed. You can skip to the end and leave a response. Pinging is currently not allowed.